Virtually no one who did not spend a lot of time traveling outside of the U.S. before 2000 would have had any idea that Swedish based Hennes & Mauritz would become a cultural icon and take over the country by storm within a few years. With heavily discounted prices making high quality trendy and stylish clothing available for the masses, it is no wonder so many people have at least two items from H&M in their closets. With over 200 stores in the U.S. and 2600 worldwide, the retail chain is the second largest global retailer trailing behind Spanish clothing manufacturer Zara and leading slightly ahead of American brand Gap, Inc. with $2.1 Billion in Sales and 81,000 employees operating in 53 countries. Being that there are close to 30 H&M stores sprinkled throughout New York City alone, we decided to peak in one of them and figure why so many short guys swear by their brand. 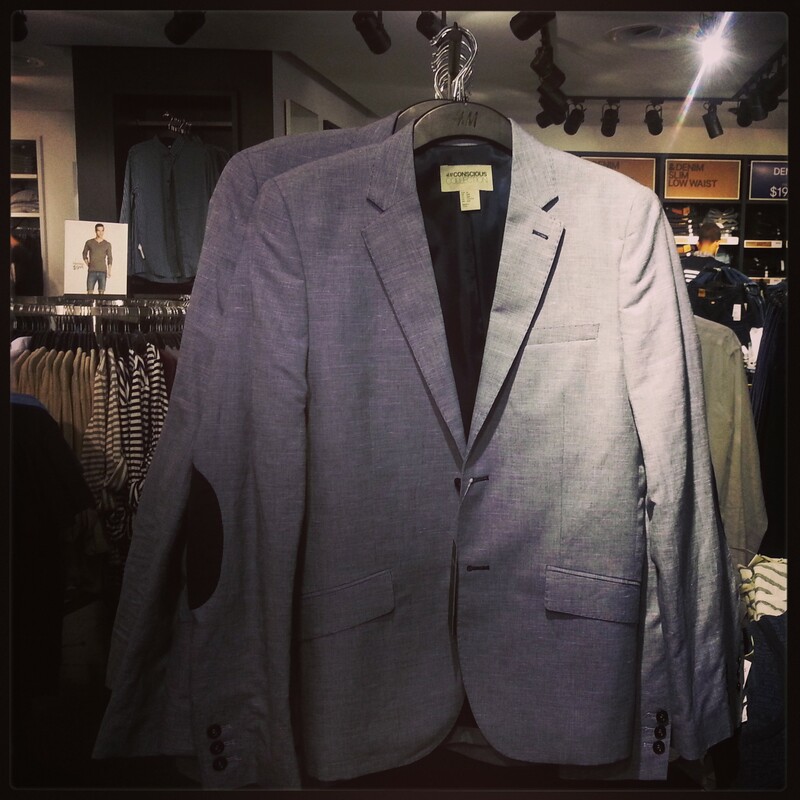 While H&M caters to both men and women and carries a myriad of clothing and accessories, we focused on a few key areas during our excursion - Dress clothes and casual wear. We walked up to their flagship location on Fifth Avenue during the height of rush hour on a sunny June Friday afternoon. A marvelous edifice enveloped in a large tile and glass facade taking up half of a city block, mannequins adorned each window showing off the store’s latest items from the bottom floor all the way to the top floor three stories up. When we walked in, the number of tourists dwarfed the amount of Native New Yorkers inside and chaos ensued as people hustled to get whatever it was they wanted so they could get to the checkout line, which literally wrapped around the first floor twice over. After talking to the greeter at the door whose crackly walkie-talkie made us made feel as if we were being directed through a parade, we made our way to the famed men’s department on the second floor. 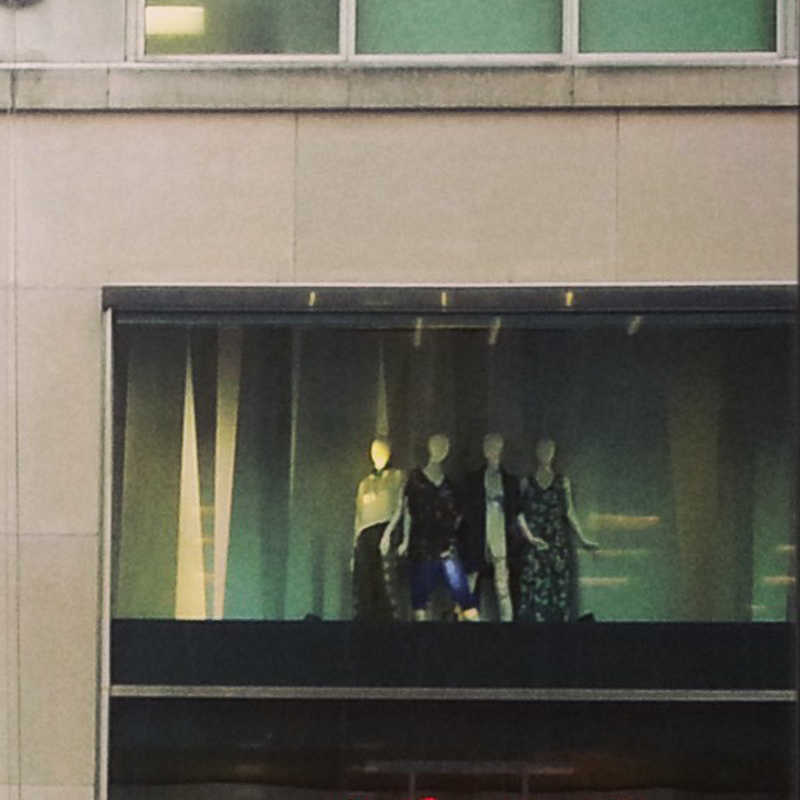 It should be noted that H&M Fifth Avenue has the largest and most extensive men’s collection of any H&M in New York. The minute you step off of the escalator onto the second floor, you will forget that you are in a discount retailer. Blazers, crisp button ups, sweaters, ties and deep hued dress pants would give you the impression that you were peering into GQ magazine. Their latest denim offerings lining the walls let you know that you are not in your dad’s clothing shop. We went straight for their blazers. The suit jackets available ranged from sizes 36S to 44. The majority were colors you would expect to find (black, gray, navy) along with neutral tones such as beige, and some trendy color combinations like navy blue with a white pinstripe on the lapel. Those going for the college professor look would be delighted to find tweed jackets complete with elbow pads ranging from brown/green, to gray/black. One thing which comforted us was that their sizes matched their tags to a tee. Their blazers are all fitted with very little breathing room. We went up to an employee who was no more than 5’5-5’6 and asked him how he felt about the fit of their blazers. He said that they’re always a perfect fit, but the sleeves sometimes can feel a bit short. This matched our sentiments exactly. This is a plus because you want to see the tips of your dress shirt at the edge of your jacket sleeves. H&M has a reputation for fitting slim bodies. With this in mind, if you have a large chest, are gymaholic, or are on the portly side, you may want to look into blazers a few sizes bigger to compensate. You may run into some issues in this case because the fit may not be symmetrical and an alteration might be in order. Like any other store, pick up what you desire and get in that fitting room. The majority of the Blazers we saw were all in the $39-$69 range. Plenty affordable. Perhaps our favorite items in H&M are their Button Down shirts. These shirts can serve as an integral part of your suit wear, or function as a casual dress shirt with jeans or slacks where you do not tuck them in. We found that even in their smallest sizes, the bottoms of their dress shirts do not go much below the crotch. The same employee who helped us with the blazers was in our vicinity. We asked him what size shirt he had on to which he replied Medium. Shirts come in solid colors, plaid designs and trendier looks (their Conscious Collection). Plaid designs come in both thin and thick with the thinnest offerings working well for dressier looks. We found red, white and blue combinations, blue and white, black and white as well as gray and charcoal. 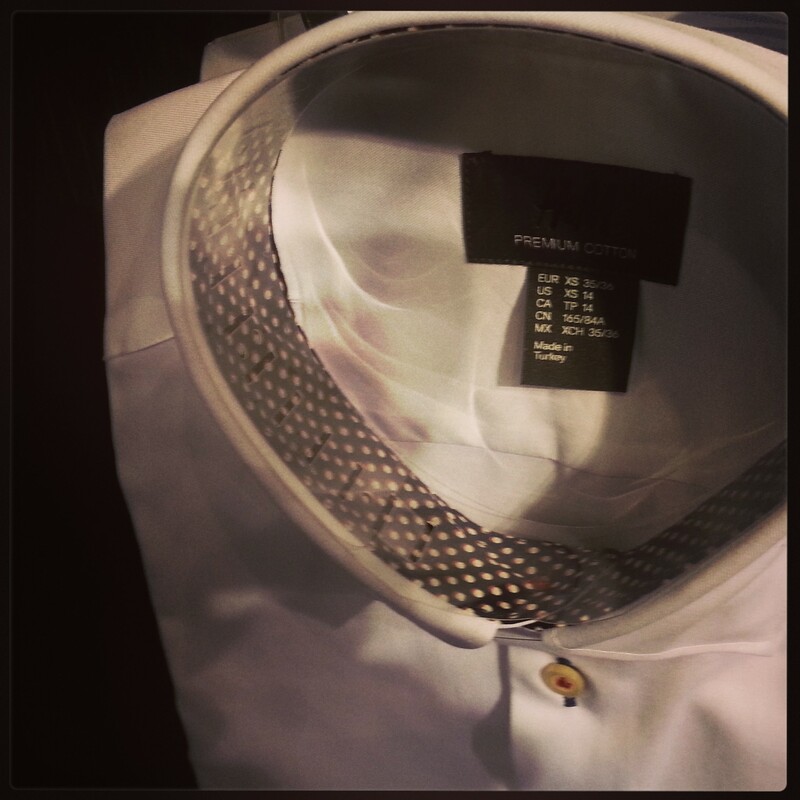 H&M dress shirt quality in our opinion is better than that of Express and Uniqlo (100% premium cotton). We’ve been shopping at H&M since they opened in the early 2000s. Shirts purchased which were washed and dried relentlessly and mercilessly over years, look and feel just as new as the day we bought them. No exaggeration. H&M Button Downs come in sizes S-XL. 5’5-5’7 guys who are slim-athletic will do fine with a Medium. Smaller guys with the same build should look into the S sizes. If you have a large frame or are portly, L and XL will do just fine. Their shirt sizes are consistent from design to design. This is not the case with their competitors. Some Express Mediums for example, extend a bit lower than some of the others. We picked up a M powder blue solid color dress shirt ($14.99), a Gray Blazer ($49.99) and a dark blue tie ($19). For close to $100, you can have a full two piece suit that looks like it costs hundreds of dollars more. Because of the selection, quality and prices, we prefer H&M to Express. Express beats H&M when it comes to color selection. You can find just about every shade of every color in Express. Uniqlo trails just behind H&M in this category, though Uniqlo offers alterations starting at just $5. That is hard to beat. That is on pants however and not shirts. When it comes to pants, we get a bit more critical. 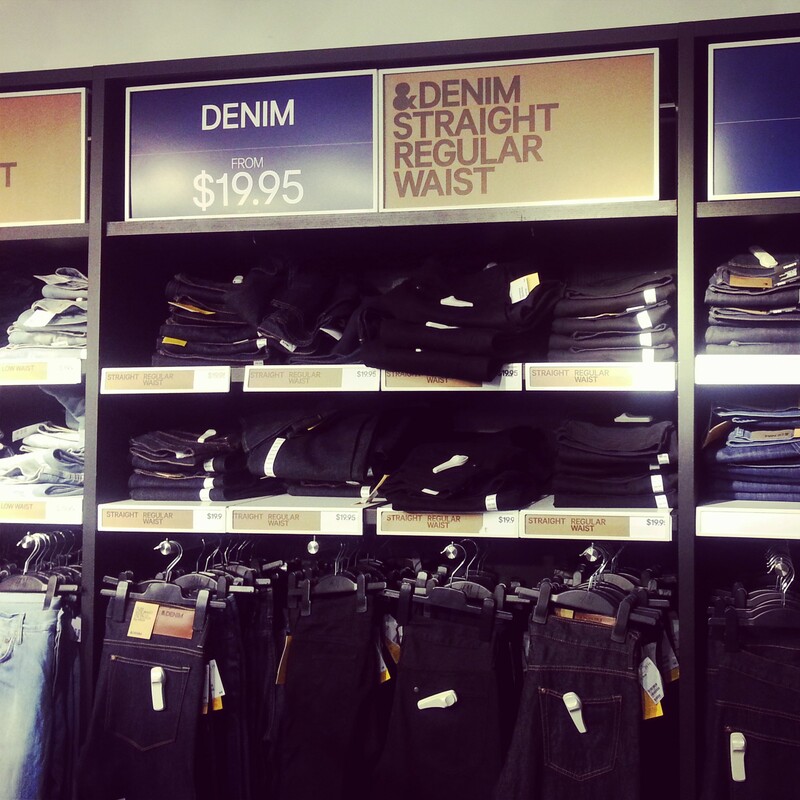 H&M’s denim keeps up with the latest trends. You’ll find dark and light dyes, ripped jeans, fitted jeans and boot cut styles. However, there is a real starchy quality to them which makes them feel a bit less than average in quality. There is a smoothness that exists with other brands that seems to be absent here. On the plus side, jeans come in just about every size. For the short guy, 28s-30s (inseam) are abundant. You’ll find waist sizes from 28-40. Dress Pants are another story. We have a love/hate relationship with H&M dress pants. If you have bulky legs or work out a lot, then you may be in for a bit of trouble. Slim legs rule as king with their pants. If you have thick thighs, moving up to the next biggest size may not work do as you’ll invariably end up with a larger waste size which would most likely kill the look you might be going for. Furthermore, their dress pants generally come with the waste size posted only. Most of them will require alteration. Keep this in mind as you peer through their selection. Unlike Uniqlo, they do not do alterations in the store. You will have to go elsewhere to get that done. The quality of their dress pants is average. Though their blazers have a toughness to them, their dress pants can feel a bit flimsy and wrinkle up pretty quickly. Aside from the expected Chinos, you will find dress pants which match their blazers as well as your typical blues, blacks and grays. In the case of building a suit or dress outfit, we preferred to pick up shirts and blazers from H&M and going elsewhere to find pants that match the aforementioned garments as closely as possible with respect to color. There is a lot to like about H&M. The quality of most of their clothes is second to none at the asking price. There is a reason why the chain has expanded so fast, and their apparel is respected in the coveted 18-49 demographic worldwide. “When in doubt, check out H&M first” is something you hear from many New Yorkers when searching from something trendy and modern, be it dressy or casual. While you may not find the vast color selection of shirts you may find elsewhere and quality of some of their pants leaves much to be desired, you can’t argue that H&M is a very strong and revered brand. They regularly update their collections and are almost always on top of fashion trends. Their strongest positive is that their clothes are of quality, look great, can take a beating and will last. After all, who wouldn’t want an investment with a heavy return? 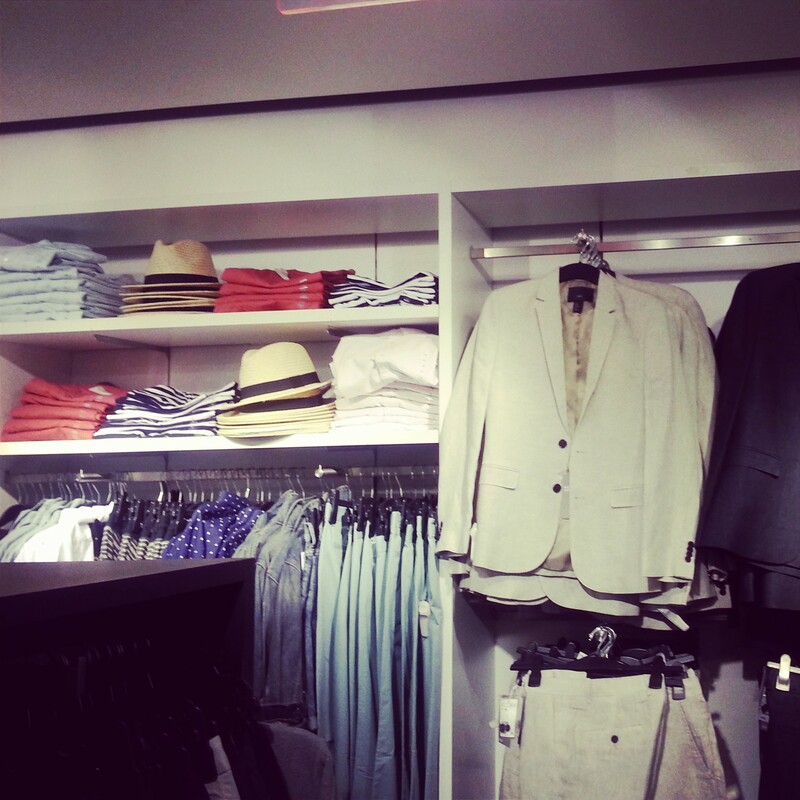 For the short guy, H&M is a no-brainer.